There’s a deceptively simple premise to this show. 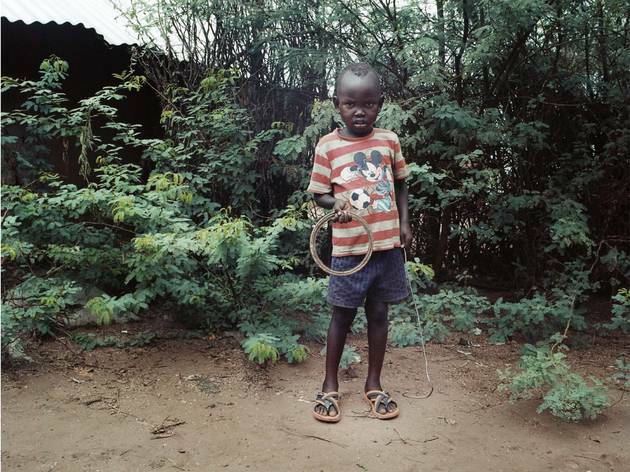 Documentary artist Mark Neville has taken photographs of children playing around the world. There are children playing in Helmand and the Highlands. In Pittsburgh and Kenya and the Ukraine. Some of them are playing children’s games, some are part of a much more grown-up world of organised celebrations: parades, feasts and dances. A large chunk of the photos are of north London playgrounds, which Neville documented in detail throughout 2016, and ‘Child’s Play’ is also a project to improve play condition for children in the UK and help address the growing problem of childhood mental illness. And that’s it. Only it’s not, of course. As you explore Neville’s amazing photos you explore a world in which what it means to be a child – and to play – varies wildly. A boy gravely holds a handful of sweets as two men butcher a goat behind him. He’s in Afghanistan, but seems no more distressed than three boys in eyeliner rehearsing ‘The Jungle Book’ in America’s rust belt, who glower at the camera. Throughout, the viewer is invited to question how children and their world are perceived by adults. These photos make you privy to the secret rituals of childhood but also exclude you from them. Three deaf children in a Ukrainian special school are engaged in some kind of bitterly serious debate, while a boy confronts the camera at Toffee Park Adventure Playground, EC1, festooned with a rope like a harpooner. Ultimately, this is Neville’s point. As he asks in his accompanying text, ‘Are children simply potential adults in the making? Or is the immediacy of childhood a richer place than we can recall?’ Time and again, these images remind you – an adult – that ‘play’ is one of the most powerful instincts that we ever experience in life. Brilliant – like this show – in its simplicity. I was very (happily) surprised by these extremely delicate, beautiful photos of children playing. But describing this exhibition like this doesn’t do it justice. Mark Neville’s work seems to truly capture the ‘childness’ in the portrayed children. There is a rawness and sweetness to them that is quite impressive. This research into the important role play has in children’s lives is a real eye-opener, being it in refugee camps, schools, an aboriginal reserve or playgrounds.